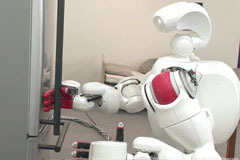 Sitting-up motion support; a caretaker adjusting the wrist position to stably gain enough reactive force from the robot caregiver that offers its arm to boost him out of bed during sitting up. 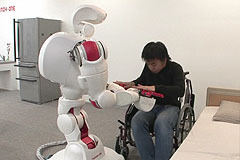 Transferring the caretaker safely onto a wheelchair; allowing the caretaker to turn on an axis of the robot’s trunk rotating to follow his movements till reaching the targeted wheelchair safely, while placing his palms on both wrists of it to enable him to put a part of his weight on the robot caregiver. 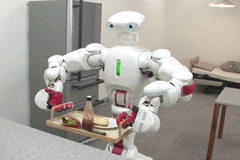 Fetching seasonings from a refrigerator; smoothly and quickly opening and closing a refrigerator with a manipulator while making the best use of mechanical passivity equipped with hand and arm joints. Giving support to making breakfast with kitchen tools; picking up a loaf of bread using a tong grasped with a multi-fingered hand and placing it onto a plate. 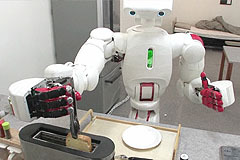 Carrying a tray with breakfast placed on; lifting a tray by putting four fingers through each handle at the tray respectively and transferring it onto a dining table instead of the caretaker who must devote himself to control a wheelchair.